New EU project “PUReSmart” coordinated by Recticel wants to make a circular product from PU! The PUReSmart project, coordinated by the Belgian company Recticel, was launched on 1 January 2019 for a duration of four years. It is supported by EUR 6 million in funding from the European Union Horizon 2020 Research and Innovation Programme. The PUReSmart collaborative consortium gathers nine partners from six different countries and seeks ways of transitioning from the current linear lifecycle of polyurethane (PU) products to a circular economy model. Thermoset PU products such as flexible and rigid foams are long-lasting, durable and useful in many different applications. They are among the six most important plastic materials produced worldwide and promote comfort and safety in daily life. Compared with thermoplastic materials, recycling thermoset PU is a much more challenging process. The PUReSmart project will explore new methods, technologies and approaches in order to overcome these challenges and transform PU into a true circular material. PUReSmart targets the recovery of over 90% of end-of-life PU with the goal of converting it into valuable inputs for new and known products. The project consortium will develop smart sorting technologies to separate a diverse range of PU materials into dedicated feedstocks. These feedstocks will be broken down into their basic components as inputs for existing PU products, and as raw materials for a newly designed polymer that merges the durability of thermosets with the circularity of thermoplastics. The PUReSmart consortium is an end-to-end collaboration spanning the entire polyurethane reprocessing value chain, and comprises both industrial players and dedicated research partners. Recticel NV (Belgium), the coordinator of the project, is a large-scale manufacturer of polyurethane products used in several markets. The firm leads the initiative to shift from a linear to a circular PU economy, thus preserving valuable raw materials. Covestro Deutschland AG (Germany), a world-leading manufacturer of high-tech polymer materials, is strongly committed to further developing the pathways to recovering basic PU building blocks. 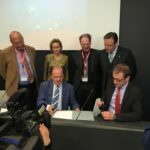 BT-Wolfgang Binder GmbH (Austria), with its Redwave trademark, offers expertise in the sensor-based smart sorting of end-of-life materials, through which waste streams can be graded into valuable fractions. WeylChem InnoTec GmbH (Germany) is a well-reputed contract development and custom synthesis company that will develop brand-new building blocks for PU and, within the WeylChem Group of companies, scale up capabilities for these new chemicals. Ecoinnovazione SRL (Italy), a research and consultancy firm in the field of lifecycle sustainability assessment, will develop sustainable assessment and strategies with a lifecycle approach that takes social impact into account. Ghent University (Belgium) is at the heart of the breakthrough in the development of new molecules for recyclable materials that must be adapted to polyurethane chemistries. KU Leuven (Belgium) has a long history in catalysis expertise and will play a crucial role in developing routes to break down thermoset materials and recuperate their basic components. Universidad De Castilla – La Mancha (Spain) will support the project with its experience in recycling thermoset PU and its capabilities in scaling up chemical processes. Ayming (France) will provide project management support and guide internal and external communication initiatives with the goal of maximising the results and outcomes of the project. This project has received funding from the European Union’s Horizon 2020 Research and Innovation Programme under grant agreement No 814543.